Level 8 Craftling: Cat walk! Haircut! Paul Bunyan! Oh my! Cat walk! Haircut! Paul Bunyan! Oh my! This post is a bunch of random photos of recent happenings in my life. 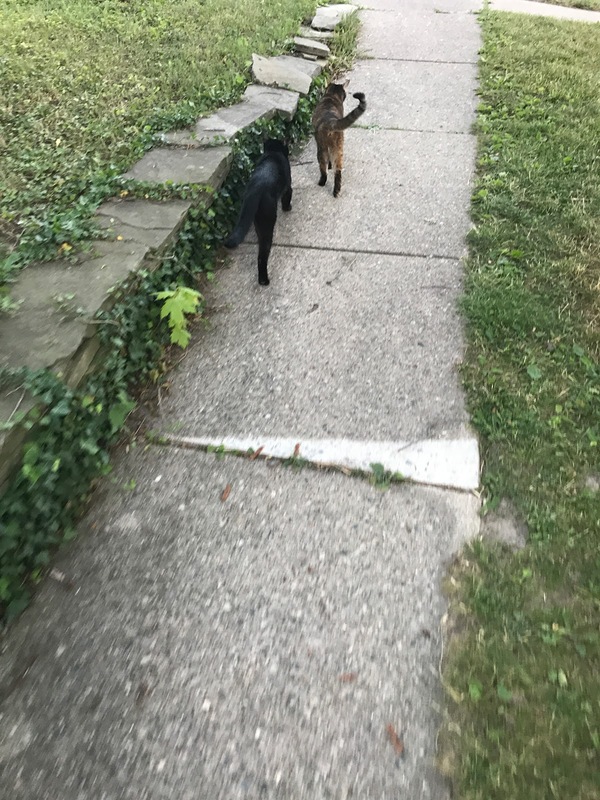 First is a series of photos from the first time my cats followed me on a walk! 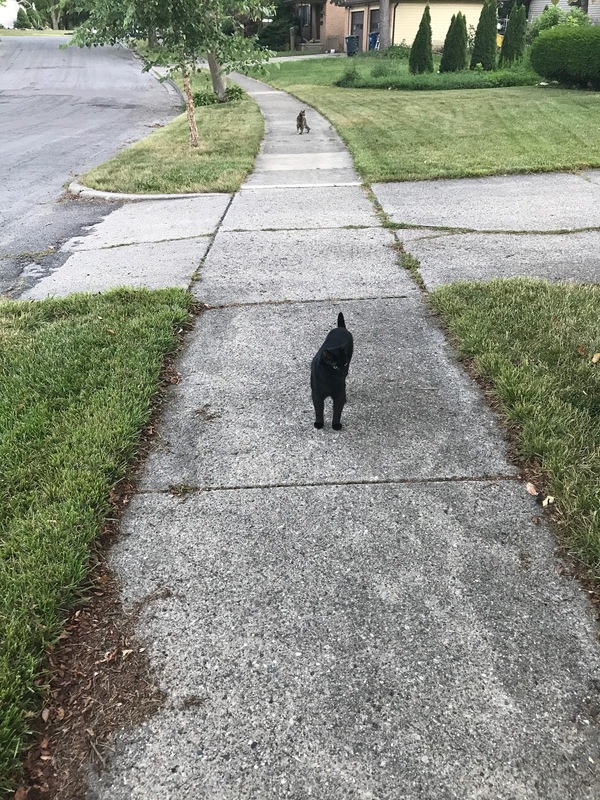 The first walk, I got two streets over before they got skittish and wanted to go back home. The second time, I got a little beyond the third street. 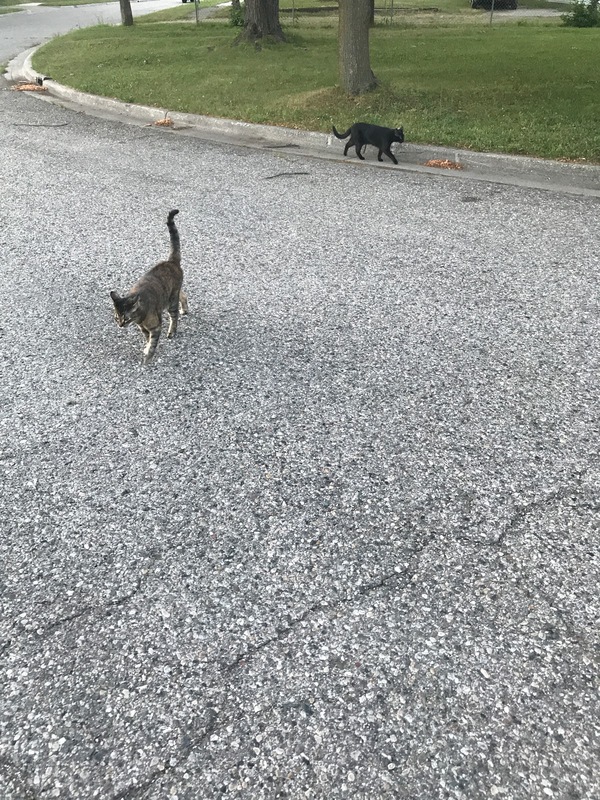 They seem to be having fun following me around. It's super adorable and I love it! Mohawk! It's the first time I've had a mohawk. I love it so far! Also, this plaid shirt cost me only a couple dollars at the best thrift shop in Ann Arbor, the PTO Thrift Shop. The only issue was that the sleeves were annoyingly about one inch too short. So I spent about 45 minutes carefully hemming the sleeves down to 3/4 sleeves. I love it now! <3 thrifting and sewing! Random photo of a recent lunch, with my Iron Man bento box and SCAdian belt knife. I'm quite happy with this fruit, veggie, and nut lunch with some summer sausage. Tasty and mostly healthy! I traveled to Minnesota recently for an awesome family reunion. This is a fun photo on a Paul Bunyan statue at a rest stop with my sister and boyfriend. I found this couch on Craigslist for $100!!! I'm so happy with it. It's definitely elevated my home a lot. It's so comfy, and so so so so much better than my previous couches, both of which went to friends who were happy to have them. And we're ending the post with more cat photos, because I can't help it. They're my beautiful fur babies and they deserve all the photo love. Kobold's a big snuggle bug. A rare photo of Gnome! She's harder to pin down. But she's still super snuggly, too, when she wants to be. This is my favorite photo of my baby girl. And another of a sleeping Kobold. Oh, cat yoga. Things are still rough adjusting to my new life schedule with the new job, and July is always hard for me (grieving month), but there are bits of joy. So I thought it would be fun to share the bits of joy, because it's important to remember those when times are difficult. Any bits of joy in your life lately?